In about the time it takes to read this page, you can make your next trip significantly safer. This quick and practical walk-around inspection is not intended to replace periodic visibility tests on a FMVSS 111 Mirror Grid. 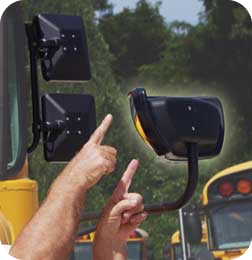 The pre-trip walk-around inspection is not always enforced as mandatory for school bus drivers. But since mirrors can be bumped and manipulated during and between runs, aquiring this habit could turn a minimal effort into a major difference in human transportation safety. Go to the rear corners of the bus at the back bumpers. Peer down the side panels of the bus towards the front. 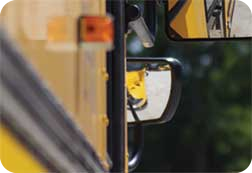 You should be able to see some portion of the cross view mirrors extended out wider that the school bus body. Most cross view mirrors are around 14” wide. It would be good to see least 4” to 6” of mirror surface extending out beyond the 96” width of the bus. Next, crouch down adjacent to the rear tires. Can you see the cross view mirrors extending out? Look for a least 30% to 40% of the cross view mirror lens to be visible from your vantage point about a foot out from the rear axle locations. Check both sides of the bus. Walk out directly in front of the bus 12’ to 14’ feet and directly in front of the center of the front bumper. Look at both the RH and LH cross view mirrors. You should be able to see some portion the edges of the mirror's reflective surface pointed towards you. Crouch down at the entrance door step well. Can you see your reflected image in the convex rear view mirror? Having a good view of the step well area augmented by the convex rearview mirror can prevent the worst accidents. The convex rear view will provide a much larger and more noticeable image of a child in this most dangerous area. 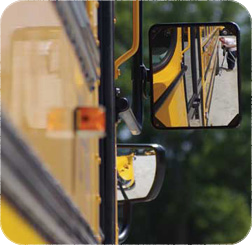 The most efficient adjustment of the rear view mirrors will show less than ½” of reflection of the school bus side walls and windows on the inside vertical surface of the mirror. The least amount of school bus that can be seen in the rear view mirrors the better. Just a narrow visual reference of the side of the bus is all that is needed. This will insure that most of mirror surface is available to see more children and cars. Often the cross view mirrors are positioned inwards for compactness at the factory or during delivery. To swing the mirror arms outwards for best visibility down the sides of the bus, the brace arm clamps and the main mounting base clamps should be loosened to allow the arms to swing out board. 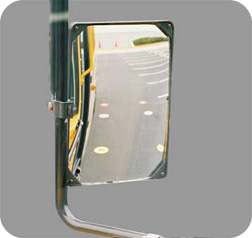 A typical school bus is generally about 96” wide, so by measuring from outside edge to outside edge of the cross view mirrors you should have a least about 104” for efficient visibility. Trip Inspection PDF - A Printable version to take to the bus yard.